August 18, 2014 bcalvanocoachingLeave a Comment on Weekly Angel Card Reading for August 18 through 24. Weekly Angel Card Reading for August 18 through 24. On my radio show for the month of September I will share on the intention of creating peace, grace and ease in our lives supported by the Archangels. For Monday and Tuesday we have the message,’ PAST LIFE HEALING’ – Forget me-not, flower : This situation has been triggered by one of your past lives. Heal the past and you bring healing into the present. The Archangel Raziel is present in this situation to care and in assisting us to release and bring balance in our life in regards to a past life situation. The situation that you are experiencing now is related to it. Archangel Raziel assists us in releasing the past and in learning and completing the lesson so the situation will not reoccur. Archangel Raziel can helps us remember this past life event so we can be clearer about the issue. Through our dreams or in meditation we can access this information. Know that whatever you are experiencing today is related to a past life issue being triggered. Knowing this you can have power over the situation and not be at the effect of it. It’s a matter of letting go of any anxiety, stress, lower energies at this time. Bring back balance in your life today by giving over your concerns to the angels. Some may consider seeing a past life regressionist or you can do this on your own with a past life regression guided meditation CD. 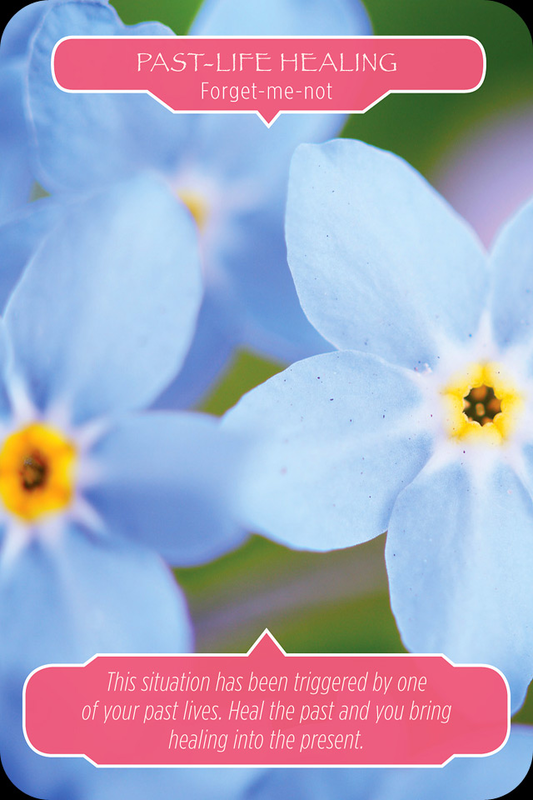 You can carry a pictures of Forget-me-nots with you or place it under your pillow at night. This will help you in remembering and healing this past life situation. 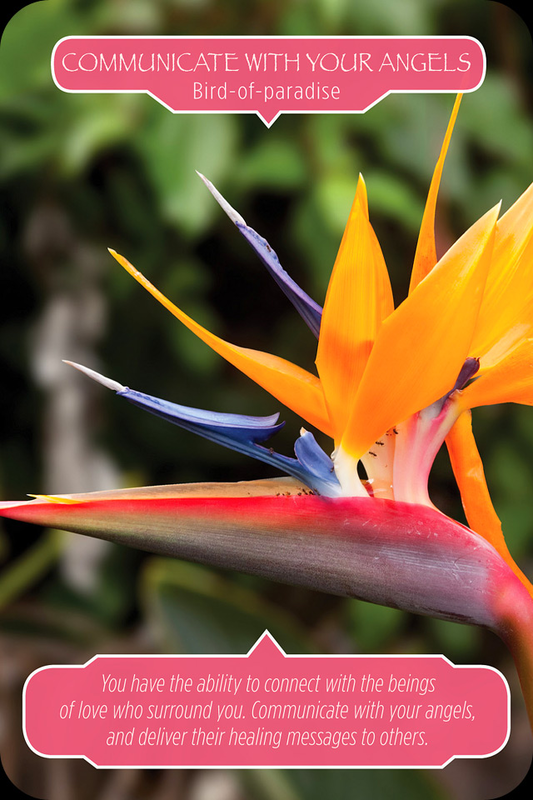 For the middle of the week, Wednesday and Thursday we have the message, ‘COMMUNICATE WITH YOUR ANGELS’, the flower, Bird of Paradise: You have the ability to connect with the beings of love who surround you. Communicate with your angels, and deliver their healing messages to others. Here we have the Archangels Gabriel and Metatron to assist us in raising our vibration so that we can clearly hear our messages and to go forth and communicate them with others. When you meditate and gaze at this flower you can experience your vibration or connection with the angels increasing. The angels say that you are ready to share your messages that you have been receiving with others. You will know in what manner this will take and with whom. The angels are asking you to communicate with them more often and they acknowledge you on your own intuitive and psychic abilities at this time. So if you have been thinking of doing so, now is the time. Your own faith is strengthened and you provide loving healing messages to others. Your divine presence makes such a difference in the world and of those near and dear to you. Your healing messages may be in your art, teaching, poetry, how you share yourself at work, and how you show love and affection with your family and friends. This is a great message about your ability and desire to connect with others at this time with your intuitive and angel messages! 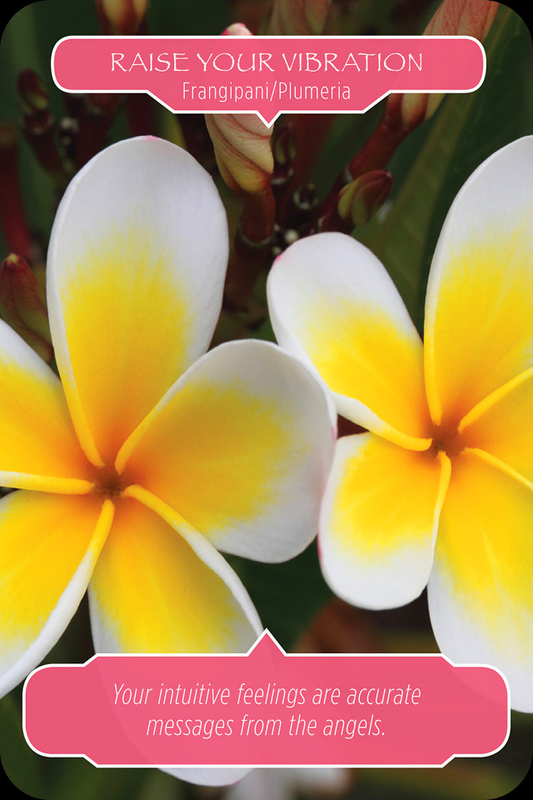 For the end of the week and weekend we have the message,’ RAISE YOUR VIBRATION’, with the flower, Frangipani or Plumeria: Your intuitive feelings are accurate messages from the angels. This is a wonderful message that follows the first two. We’ve addressed and cleared a past life issue that may have hindered or blocked us from being fully expressive bringing balance in our lives. We are sharing ourselves more authentically and powerfully. By raising our vibration or frequency we connect more powerfully to our intuition and with the angels. Focusing on this beautiful flower assists us with this! The message also is that you have already met your angels and they are completely around you. Pay attention to any thoughts, feelings, sounds or visons that you receive as these are angel messages. If you need more clarity simply ask the angels for another sign! Some may be drawn to learning more about and using crystals to assist your raising your frequency. This message is an acknowledgement that you are highly intuitive this week, have made contact with your angels and are ready to take it to the next level! Personal readings can be for guidance and coaching in any area of your life including your life purpose, relationships, health, career, spirituality and energy clearing and balancing. I have 60, 45, 30 & 15 minute by phone or an audio recording for you. Contact me for pricing. If you have been enjoying these weekly angel readings please let me know and also share them with your friends! Previous Weekly Angel Oracle Card Reading for August 11 through 17.